The whole of my mother's family was in London the other week - unusal as my aunt lives in Rome and my uncle in Somerset - and my uncle made a delicious fish dish. He made it with cod, but I decided to recreate it using salmon as I thought the flavours would work similarly well together. They did, and it got the other half's seal of approval. Excellent! Begin by making the parmentier potatoes: preheat oven to 200°C, then peel and dice the potatoes into 1.5cm cubes. Melt 25g of butter in a pan and gently fry for 5-10 minutes, stirring occasionally to prevent the potatoes from browning or sticking to the pan. Then transfer the potatoes to a baking tray, add a little more butter and a little salt and pepper, then roast for up to half an hour, shaking halfway to prevent them from sticking. While the potatoes are roasting, finely chop the onion and carrot and fry gently in a little olive oil for about 5 minutes, until the onions are translucent. Slice the celery and add to the frying pan. Cook for a further couple of minutes then add the lentils. I use pre-cooked Merchant Gourmet puy lentils to save a little time. Cook the lentils for a minute or so, then add the chicken stock and white wine. Simmer down until the liquid is almost gone. When the sauce is nearly cooked, fire up the grill or griddle, then grill the salmon until pink cooked through but not dry - about 5 minutes. 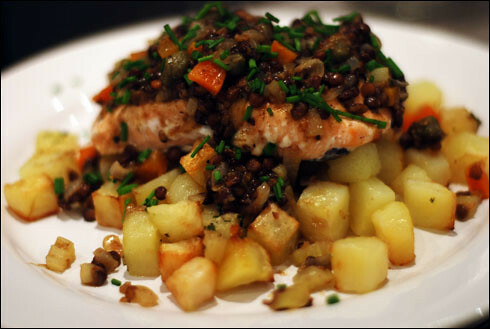 To serve, divide the parmentier potatoes between the four plates, then place the salmon on top. Finish by spooning over a tablespoon or so of the lentil sauce and garnish with a sprinkle of chopped chives. Been meaning to cook this since it went up. Finally got around to it this weekend. Loved the flavours of it but I totally screwed up the lentils by not buying pre-cooked ones and miscalculating the cooking time for the lentils (having, shockingly, never cooked lentils before). But this is definitely one to try again. The white wine and the salmon is a great mix.